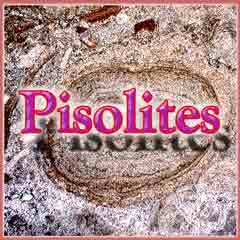 Pisolites, oncoids, and oncolites are enveloped by irregular layers. All these grains are frequently larger than ooids and commonly are over a centimeter in diameter. 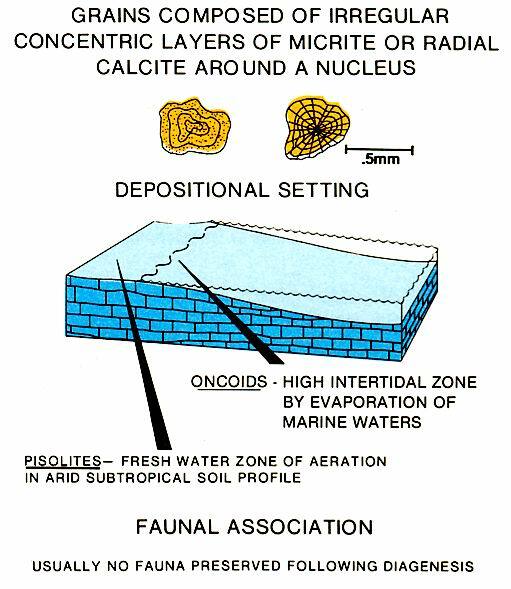 Pisolites form by the precipitation of calcium Carbonate around nuclei trapped in sediment within the vadose zone of soils or marine tidal flats (Figure 24). Oncoids form on the surface of intertidal and supratidal flats where Carbonate precipitates from salt water spray and marine flood waters (left figure). Though these grains are termed oncoids, in Limestones they probably cannot be distinguished from pisolites. 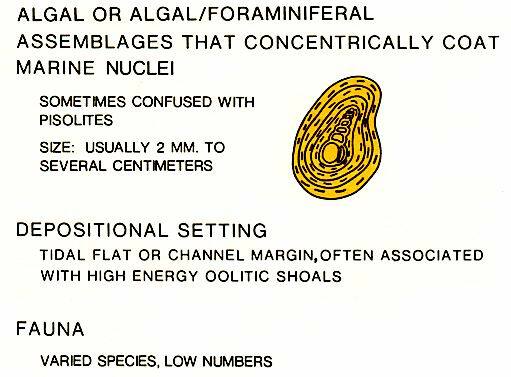 Finally, other grains resembling pisolites but termed oncolites are formed by accretions of blue-green algae and trapped sediment around a nucleus in moderately protected marine environments (figure below). Variations of this type of grain occur when the coatings are formed by algae and foraminifera or by red algae to form rhodolites.